This is a good thing. Stance is important, and having it super slammed would be sure to provide a number of benefits, not least in terms of the aesthetics. In addition, mounting the front subframe further forward would extend the wheelbase, allowing better weight distribution, with the monster motor mounted relatively further behind the front wheels. To finish the front-end modifications, a custom fibreglass Pro Mod–style front end would be installed, with lengthened fenders and bonnet, and a stock Premier-style nose cone supported by a tube frame. Engine-wise, Tony would show that he’s not a one-trick pony by going for a pair of turbos — but not under the hood. 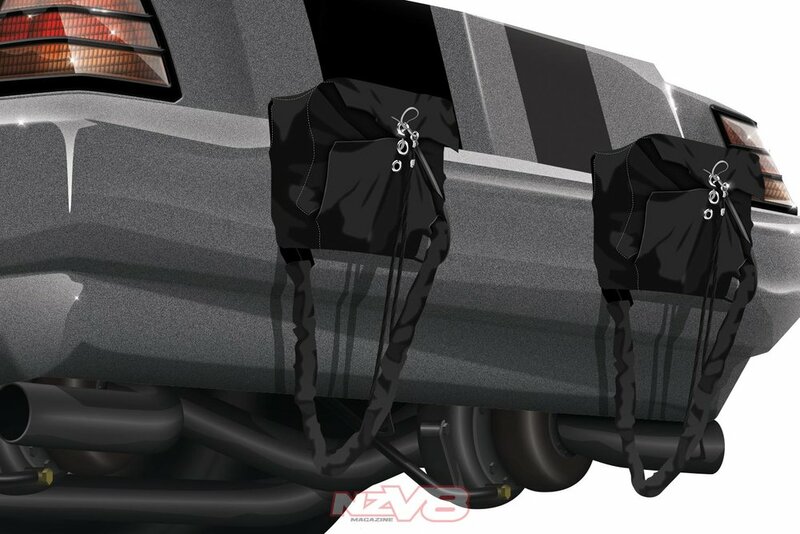 Instead, the monster turbos would be mounted just behind the diff — insulated, of course, from the twin rear-mounted parachutes the car would need. Those turbos would send plenty of compressed air into a custom plenum above an eight-stack electronic fuel injection (EFI) system atop a Sonny Leonard 1000-cube mountain motor. It sounds far-fetched, but it’s only a Lotto win away! “Achieving something along the lines of the John Zappia or Trevor Smith doorslammer look on the street could require some pretty extensive suspension, chassis, and structural mods, depending on just how far you wanted to go. However, even if you’re after the radical approach, there’s no reason that can’t be achieved, within the normal realms of maintaining sufficient ground clearance, having a decent steering lock, having enough suspension travel to get around our country’s sweet roading network, and having brakes capable of dealing with the performance increase. “Shedding some unneeded sheet metal in the front and keeping the engine bay free of turbochargers would also help if you’re trying to reduce weight, and getting the hood line as low as possible and relocating turbos to the rear would greatly reduce engine-bay heat. Loading the turbos under the boot floor would also help with front-to-rear weight distribution, but keeping heat and velocity high in the exhaust is important, and getting those turbos spinning with a side pipe — which would allow the exhaust gases to cool — would present some challenges. If it was done with the right advice, it would be possible to get a great performance outcome with a point of difference. “Getting the exhaust noise levels down to within the government’s requirements could be a challenge. While traditionally front-mounted turbos do naturally reduce exhaust noise, when they’re rear mounted, there’s the turbo noise to deal with, and mufflers are the enemy when you’re trying to maintain the aforementioned exhaust-gas velocity. “As we’ve mentioned before, if The New Zealand Car Construction Manual requirements were followed throughout the build, and if a certifier were involved from the start, you would be unlikely to have any dramas when it came time for your final inspection.